Modkat today introduced the Modkat XL, an all-new cat litter box designed for plus-size, large-breed, or multiple cat households. Modkat today introduced the Modkat XL, an all-new cat litter box designed for plus-size, large-breed, or multiple cat households. The box was designed for cat owners who love the beautiful design of the original Modkat but require a larger box and the flexibility of front-or top-entry. 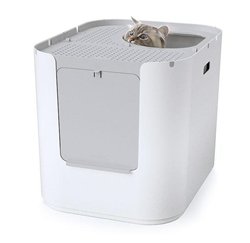 Modkat XL is the first dual-entry litter box on the market, offering both top-entry and front-entry configurations. It’s the largest top-entry litter box available and measures 21 inches long, 16.5 inches wide, and 17 tall. And like the original Modkat, it’s virtually straight from the bottom to the top so the headroom matches the footprint. When using the top-entry configuration with the full height reusable liner, the box keeps all the litter inside no matter how vigorously a cat digs or where they aim. Whether your cat gently climbs up or skittishly leaps out, gravity pulls litter from their paws. To finish the job, the lid doubles as a walk-off mat, keeping floors practically pebble free. The lid swivels open to ensure any stray litter falls back inside, and it lifts straight off to provide full access for thorough cleaning. For senior cats that prefer the walk-in front-entry option, Modkat XL easily converts. Users can pop out the front cover, switch to the front-entry liner, and snap on the walk-off platform. Modkat XL shares many of the award-winning design features of its predecessor, including the high-gloss mirror finish, the swiveling lid, reusable liner, and the ergonomic scoop. Like Modkat’s other litter boxes, Modkat XL comes with the company’s exclusive, patent-pending reusable liners. Liner hooks at each corner ensure they stay put and make the liner a snap to change. They are constructed from durable tarpaulin, so they are scratch-resistant, easy to clean, and can last up to three months. The included Modkat Curved Litter Scoop has an ergonomic handle angled to effortlessly reach the depths of the litter box. The front edge matches the contours of the litter box and hangs neatly on either side for convenient storage. Modkat has received numerous design and pet industry awards, including multiple Red Dot Design Awards, the ICFF Editors Choice Award, and several Pet Business Industry Recognition Awards. And has been recognized in numerous publications including Wirecutter, Forbes, Dwell, The New York Times, The Wall Street Journal, The Knot, Houzz, Gizmodo, NYCxDESIGN, BuzzFeed, Wanted Design, DWR Design Notes, The Dieline, and Apartment Therapy.